And Lehman Caves that descend deep underground at the base of the mountain. After we got set up in the campground (my site with wild roses on one side, a rushing creek on the other, and the mountain behind), we decided to tour the caves first. These are not the only caves in the park, but they are they only ones open to the public via ranger-guided tours. The caves were formed (and the process continues) by water and snowmelt seeping through cracks in the limestone, dissolving and enlarging the fractures. A stalactite that had been broken off is slowly regrowing. The ranger said that small segment represents a hundred years of growth, so we can only imagine how old the larger formations are. Looking up as we walk through a narrow passageway. The caves were discovered by the land owner, Ab Lehman in 1885. He began charging visitors $1 to explore the cave by candlelight. Until 1940, when a tunnel was constructed, visitors to the cave lowered themselves through this original entrance. This large room is called the "Lodge," because it is said to have been used for initiation ceremonies into the Elks Club. It was also used for dances, and perhaps a speakeasy during prohibition. Stalactites were broken off the ceiling so people wouldn't hit their heads. They didn't realize the damage they caused. It's amazing the caves are as well preserved as they are, as early caretakers and visitors were ignorant of the importance of protecting these fragile formations. This room was covered with graffiti on the ceiling, much of it written with soot from candle flames. Early visitors had to come through this crawl space to get to this part of the cave. 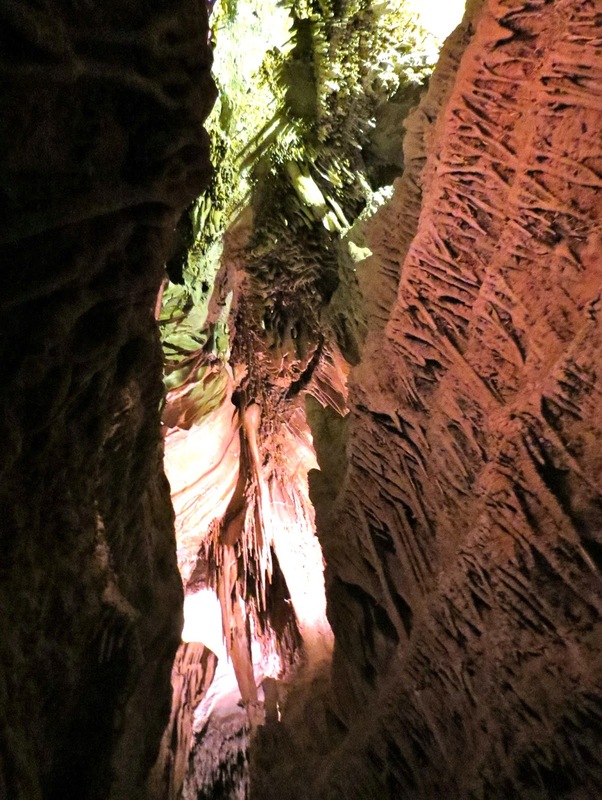 The formations were beautiful, and even more colorful when the guide shown an ultraviolet light on them. The next day we took the Wheeler Peak Scenic Drive up the mountain to the 10,000 foot level. View of the valley from an overlook. From the parking area at the top, we took the 3-mile Alpine Lakes Loop Trail (blue line) which climbed another 500 feet, passing two glacial lakes. Snow is melting slowly, filling creeks with run-off. A previous hiker left this little snowman. Groves of aspen amid ponderosa pine. 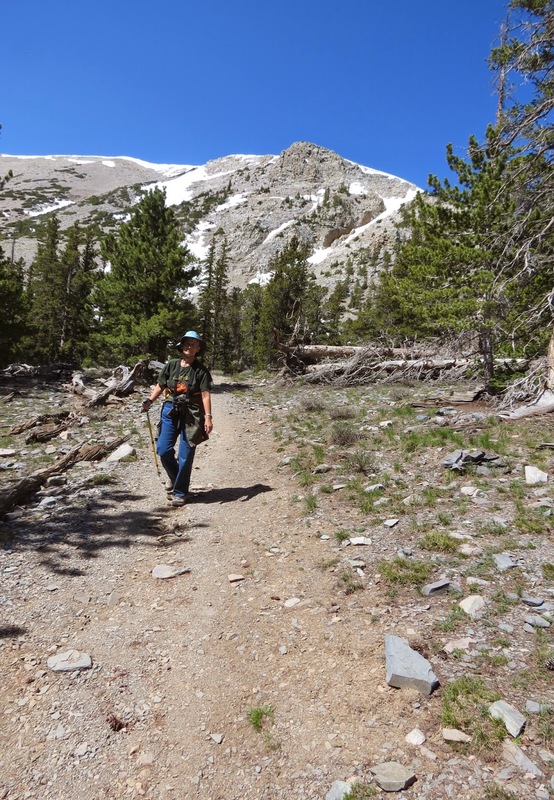 Trail leading to Stella Lake. A shallow depression formed by glaciers and filled with snow-melt and rain. A knapsack on her back... anybody remember that song? Birdie thought this place needed a snowman too. This creek of snow-melt flows into another glacial lake. We sat on a downed tree and had lunch beside this lake. Elevation is 10,230 feet at Teresa Lake, a little lower than Stella Lake. Sometimes the snow covered the trail. And we had to cross several creeks....or the same creek several times. Part of the Scenic Drive up the mountain can be seen here. Tomorrow we travel again....this time to the Ruby Mountains of northern Nevada. May not have cell/internet service again. Fal de ri, fal de rah, a knapsack on our back. Wow, snow and it's mid 90s here. Still, don't like snow. I hear you can choose your temperature by going up or down the mountain though....a little birdie told me. I remember that song we learned it in Junior High Choir and I've always loved it. Funny how we can remember the words to songs so well for so long. I think this is my favorite place so far that you have been.